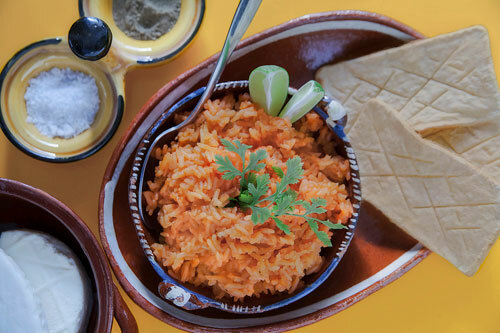 The red rice can be considered as the simple version of the Mexican rice , since this rice is cooked without vegetables. The magic in this recipe is to come out of the routine and change the rice color from white to red . The trick lies in preparing a kind of red salsa, in which the rice is cooked so the color change takes effect. The beauty of this recipe is that the rice flavor becomes more concentrated, fresh and with slight sweet notes . Oh and of course that the red color makes it more appealing and appetizing. This rice can be served as an appetizer , it can also be used to accompany any dish with beef , chicken or fish. And if you want to go further you can use it for breakfast next to some green chilaquiles. Do not be intimidated with the fact of preparing rice it is very easy. Just follow the “golden rule" in which the liquid has to double the rice. Another important aspect at the time of preparing the rice is to use a saucepan with thick bottom and that is not too deep. In this way you will get the best results. We give this recipe with olive oil although you could also use vegetable oil. Total preparation time 25 minutes . Pour in a measuring cup the mixture that was blended and verify that you have 2 cups of salsa (1/2 qt); then set aside. If you would have more than 2 cups remove the remaining salsa and if you would have less than 2 cups of salsa add water up to the 2 cups mark. Rinse in a strainer 1 cup of white rice, then reserve. It is important to rinse well the rice before cooking it because this eliminates the starch that it has on its surface. Moreover the rice grain ends up looser so it doesn’t stick when cooking. Heat in a saucepan over low heat 1 tablespoons of olive oil. Put in the saucepan the cup of white rice that was rinsed and fry it for about 3 minutes, until it acquires a golden color; stir constantly. The rice has to brown so it acquires well the red color. The 2 cups of Red Salsa that were measured. Mix the saucepan ingredients and bring the salsa to a boil over high heat. When the salsa boils reduce to low heat, cover the saucepan and leave the rice cooking for about 15 minutes, until the liquid has totally consumed. Throughout this process don’t stir nor touch the rice because it will become a mess. To verify that the rice is cooked stick the turner all the way into the bottom of the saucepan and drag the rice. If there is no more water in the bottom the rice is ready... if there is still water the rice needs more cooking. When the cooking is done turn off the heat and leave the red rice resting for about 4 minutes, until the rice grains absorb the moisture and are loose. Tip: Put lime to this rice and you will see what is delicious. Recommendation: Prepare some quesadillas to accompany this rice – also put on the table some pickled chilies and vegetables. Variation: Let’s change red for white. Did you like the Red Rice? If you want a very good blender... don’t think it twice and go for the “Ninja Professional Blender". With its 6 blades technology it is capable of blending all in seconds. It really is very powerful! Use the “Lundbeg Rice" to make your red rice. The beauty of this rice is that it is organic, it cooks perfect and it has lots of taste. Try the “Pulparindos", a delicious Mexican candy that is prepared with tamarind.